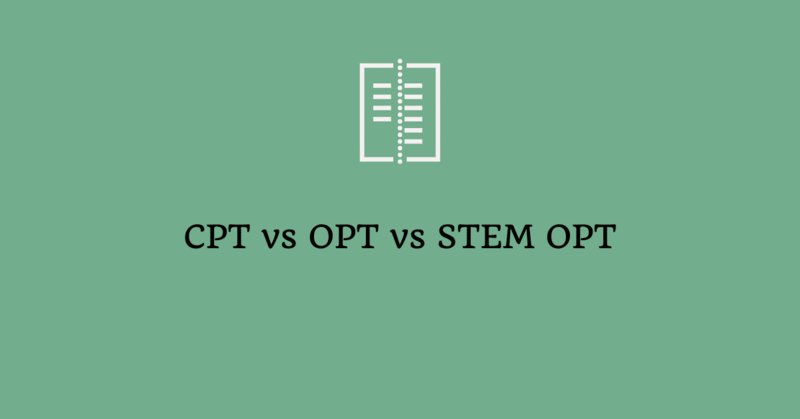 So, do you want to know the difference between CPT, OPT and STEM OPT? Let’s start with the acronyms, OPT and STEM first, Ok? OPT and STEM OPT is available for International Students studying in the USA on F-1 Student Visa. That’s the main set of differences between OPT vs STEM OPT. Did I miss anything? Please let me know in the comments section. CPT is a different beast altogether. And there’s no commonality with OPT or STEM OPT to be included in the above table. So, including some of the key points in a separate section. For instance, some courses require CPT as part of the Curriculum. PS: I typically don’t recommend a university, if they have a policy to not allow CPT during the Fall or Spring Semester or Full-Time CPT. The Study in States site has a really useful tool for OPT Dates. Please pay close attention to the Key OPT and STEM OPT application dates. I have a quick question and it is an emergency. Today is the last day for USCIS to receive my initial 12 months OPT package. I have mailed them my the OPT package today. Today will be the 60th day. Will my opt application gets rejected? I can’t think of any reason why someone could mail the Initial 12 Months OPT on the 60th day of their Grace Period. If I’m in USA for 6 years on F1 Visa, Do I qualify for exemption from social security tax? Do I qualify to file form 1040NR? Can I file 1040 and claim refund of ss tax? If I file 1040, not 1040NR and my employer did not withhold ss tax, will IRS assess when I file my 1040 because I did not file 1040NR? Hi this is Soumya. I really enjoy reading your blogs and articles. I have done my Master’s in Public Health, Environmental Health which do not come under STEM category. Currently, I am in my OPT period which started from Oct 2nd 2018 and it ends on Oct 1st 2019. My next plan is to pursue my PhD in Environmental Engineering if I get the admit or else Mater’s in Environmental Engineering. So I have a question that if I do my second master’s can I apply for STEM OPT later when I complete it or can I apply for PRE OPT during my second Mater’s in STEM category to save my OPT for Masters level as we are eligible to apply for OPT only once for each level of education. I request you to please advice me the best thing to do as I regret doing my Master’s in Non-Stem degree. Use the https://forums.happyschools.com/ for Q&A. Thanks.